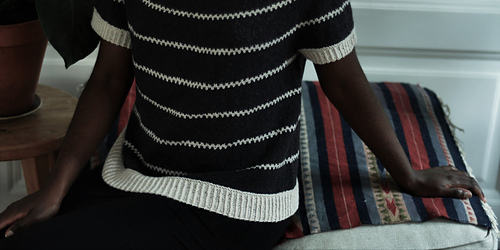 Eyre is a modest, wearable and stylish short sleeved design with a relaxed and comfortable fit. 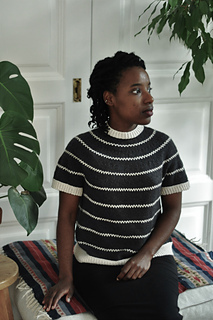 Drawing inspiration from a classic Nordic fair isle pattern to add detail and a flowing, striking framing of the neck and shoulders, it is topped off with a centered buttoned neck split detail and twisted single rib. Wear it with your favourite pencil skirt or your best pair of jeans and feel both comfortable and good looking in this cute, eye-catching design! 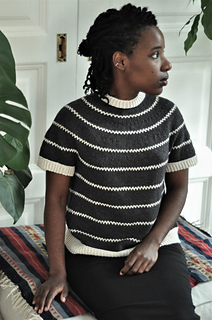 Beginning with a twisted rib tubular cast on, the garment is worked in the round from the bottom up where the body and the sleeves are knitted separately and then joined at the armholes. 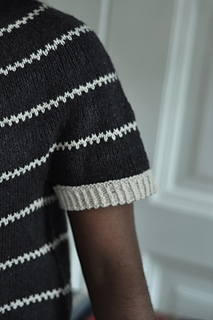 The yoke is shaped through a number of decrease rounds and the neckline is shaped using short rows. 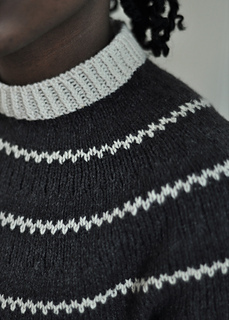 The neck split is created while working the short rows. 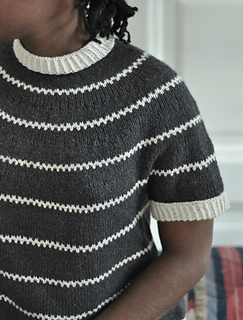 Once the neck is completed it is bound off using a sewn twisted tubular bind off method. 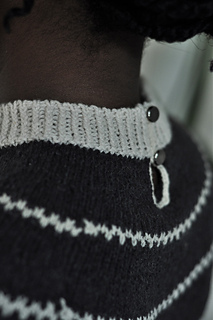 The neck split detail is reinforced with crochet slip stitches using the contrast colour and button loops are added using crochet chain stitches. 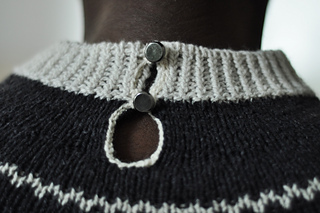 Buttons are then sewn onto the garment. The colour work is charted. If you prefer to use an alternative cast on method, choose one that is stretchy. 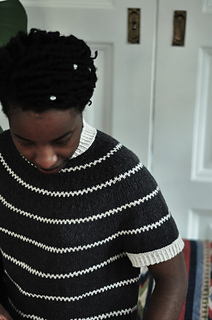 Always use a needle size that will result in the correct gauge after blocking. Needles/Hooks: One 3.5 mm (US 4) 80 cm (32’’) circular needle, two 3.5 mm (US 4) 40 cm (16’’) circular needles (the second needle is only necessary if you choose to follow the sewn twisted tubular bind off method), one set of DPNs size 3.5 mm (US 4), one 3.5 mm (US 4) crochet hook. Notions: Two stitch markers (second marker is optional), one tapestry needle, scrap yarn, stitch holders (optional), two small buttons.